A spokesman for the state Department of Environmental Protection was more realistic: “There’s no evidence at all, any scientific evidence, of such a creature.” But I wanted to believe. I told my wife about the snake. We live near the lake. Sussex County is a collection of lakes, rivers, and state land: the Vermont of the metropolitan area. My family used to own a restaurant on Lake Hopatcong’s Bertrand Island, home to an amusement park until the early 1980s. We should go see the snake, I said. My wife rolled her eyes, and looked at our twin daughters, still infants. We weren’t going anywhere. Greg Watry went to the lake; he covered the search for The New Jersey Herald, the local paper. Watry told me that a snake expert had “claimed the snake swam through his legs, avoiding capture.” The expert said it was an anaconda. Watry said the snake even inspired a parody Twitter account, @HopatcongBoa, the anonymous owner of which never broke character during an interview. Unamused local officials claimed the attention was affecting summer tourism. The search was abandoned, but not before the phantom snake reached national news. David Letterman included the creature in his opening monologue, quipping “I am certain that this snake is the only one that wasn’t involved in the bridge closing,” referring to a September 2013 scheme to close Fort Lee access lanes on the George Washington Bridge. The closing created a traffic nightmare in an area used to daily slogs. Later dubbed “Bridgegate,” the plan was hatched by David Wildstein, director of interstate capital projects for the Port Authority of New York and New Jersey. The position was created specifically for Wildstein, who was appointed by Christopher J. Christie, the governor of New Jersey. I know the joke: all politicians are snakes. That doesn’t quite apply here. Chris Christie isn’t a snake. He’s a chimera. I can’t say that I loved my summer job for the Morris County Department of Elections, but it was a formative experience. I first registered as a Republican because everyone was a Republican in Morris County, N.J. Even the Democrats. Daily office visits from politicians — replete with handshakes, laughs, pats on the back, and promises — changed my naive view of politics. Americans lament the partisan politics of Republicans versus the Democrats, but my summer working in the election office taught me it is actually the politicians versus the citizens. The politicians almost always won. The year before I worked there, the election office had an infamous visitor. Documentarian and gadfly Michael Moore had tried to run a ficus for New Jersey’s 11th congressional district. Unfortunately, the tree was not a registered voter, and could not be listed on the ballot. Some say Florida is the strangest state in the union, but New Jersey is the weirdest. From Weird NJ magazine to Double Trouble State Park to the Jersey Devil, the Garden State is an amalgamation of the odd, the exaggerated, and the incomprehensible. I say this with love. Yet New Jersey’s labyrinthine highways and shadowing from Philadelphia and New York City have created a geographical and cultural experiment. New Jersey is a state of wealth adjacent to poverty, of manicured suburbs near pockmarked urban streets — both close to swamp-bordered industrial plants. A hybrid state, New Jersey is the perfect breeding ground for a chimera. “The Word in the desert / Is most attacked by voices of temptation, / The crying shadow in the funeral dance, / The loud lament of the disconsolate chimera.” So ends a stanza of T.S. Eliot’s long poem, “The Four Quartets.” Homer’s Chimera in The Iliad was the first written incarnation of the beast. Samuel Butler translates this “savage monster…who was not a human being, but a goddess, for she had the head of a lion and the tail of a serpent, while her body was that of a goat, and she breathed forth flames of fire.” The original Chimera scourged the Lycians until it was killed by Bellerophon. Chimeras are impossibilities made real. Rather than bellowing about beasts, we now use the word chimera to describe duplicities. Illusions. Christie’s missive cites a Bergen Record article by reporter Shawn Boburg for evidence of Wildstein’s “tumultuous” nature. Boburg’s prophetic 2012 article, published a year before Bridgegate, actually paints Wildstein and Christie as confidants rather than combatants. Citing “longtime employees” of the Port Authority, Boburg claims that Wildstein was handpicked as the “perfect instrument to help shake things up” at the agency. Not simply an obscure blogger, Wildstein was smart, witty, and possessed an encyclopedic knowledge of New Jersey’s convoluted political history. Boburg’s sources explain that Wildstein “seems to serve as the administration’s eyes and ears within the byzantine agency.” He is described as “intimidating, hardworking, intelligent, private and fiercely loyal to the governor.” Wildstein has since pleaded guilty to his involvement in Bridgegate, and has agreed to testify against two now-indicted Christie insiders, Bill Baroni and Bridget Anne Kelly. U.S. Attorney Paul Fishman’s indictment is fascinating: the bridge access lanes were closed to punish Mark Sokolich, the Democratic mayor of Fort Lee, who had refused to endorse Christie for re-election. The lane closures and traffic congestion were purposefully planned for the first day of school. In a state desensitized to corruption and political revenge, this was unique: in order to punish a politician, Christie’s insiders punished citizens. Governor Christie himself has not been indicted in relation to Bridgegate. He continues to claim innocence, even demanding that the press apologize to him — the same way he once said The Wall Street Journal would apologize to the now federally-implicated Wildstein and Baroni. In a December 2013 press conference, Christie quipped that he “worked the cones” during the lane closures; “I was actually the guy out there, in overalls and a hat.” When the traffic study was revealed to be a sham, Christie visited Fort Lee to personally apologize to the mayor. Matt Katz, who has been covering Christie for the past five years, and whose biography of the governor is forthcoming, has raised questions about Christie’s evolving claims about his knowledge of the lane closures. A native of the Bronx, Katz is a Christie sage; his fierce objectivity and respect for the governor’s political acumen make his observations all the more damning. After Bridgegate first made news, Christie commissioned an internal investigation, led by noted New Jersey attorney Randy Mastro. Mastro’s law firm has billed the state’s taxpayers nearly $8 million. Christie has been claiming that the Mastro Report cleared him of any wrongdoing, but Katz is skeptical. He explains that although Mastro’s team conducted “hundreds of interviews” as part of the report, no transcripts or recordings have been released. Only a U.S. District Court judge’s ruling has forced the law firm to make those notes available as part of Baroni and Kelly’s federal trial. The investigation has become an illusion of an illusion: another performance. The Daily Beast’s Olivia Nuzzi is by turns hilarious and prescient when writing about Christie. Unlike national reporters who fawn over Christie’s storytelling ability, Nuzzi skewers his claims. She knows Christie’s history. One example: during his 1994 run for freeholder in Morris County, Christie claimed his opponents were being investigated by the prosecutor’s office. During the television ad, Christie, seated next to his wife and infant son, says “I propose a strict code of ethical conduct for all elected officials.” His claim was a lie. He lost a defamation lawsuit, and his apology ran in a local newspaper. Yet Nuzzi and Katz are only joined by a handful of other local reporters in their diligence. Chris Christie owns the state media. The Star Ledger, the largest newspaper in the state, endorsed Christie for governor twice. A left-leaning paper that shares Christie’s animus toward public-sector unions, The Star Ledger rescinded its second endorsement and has since gone on the offensive, calling Christie a “liar,” but the damage has been done. Christie doesn’t need New Jersey anymore. The Garden State’s media has given this chimera the light and attention needed for his next political metamorphosis. Slate’s John Dickerson has called Chris Christie a “performance artist,” but that title is a misnomer. The practical end of performance art is an extension of theater into the spheres of life; whether they practice stillness or subversion, performance artists do not use their art for mere service. Chris Christie is a politician. He is the prototypical politician. He wants to win. His every move and utterance is finely calibrated. His outbursts — telling a Hurricane Sandy activist to “sit down and shut up” or calling a former Navy SEAL an “idiot” — are not the slip-ups of an amateur; they are the myth-making of an intelligent, ambitious man. Myths are necessary when reality is troubling. Only a chimera like Christie could run for president on his record. Standard & Poor’s, Moody’s, and Fitch — the three major credit rating forms — have, together, downgraded the state’s bond rating nine times during Christie’s tenure. Christie’s 2011 sweeping and signature reform of public worker health care and pension contributions was supposed to show his talent for bipartisan compromise, as well as his ability to break the backs of unions. While public workers increased their financial contributions, Christie’s lawyers recently argued that his own touchstone legislation, including the state’s pension funding, was unconstitutional. The state’s transportation fund is anemic. Christie’s presidential aspirations have caused him to be out of the state for nearly 40 percent of his second term — that absence has riled taxpayers, who have to foot the bill for his extensive security detail of state troopers. Not to mention his administration’s paltry settlement with Exxon Mobil over contamination at the company’s Bayway and Bayonne refineries. While Lake Hopatcong visitors were afraid that a snake would eat their pets, Chris Christie traveled the state on a new round of town halls. Imagine a garrulous boxer in the round, with a microphone and adoring fans (Christie tends to hold town halls in areas that lean heavily Republican). As an actor, this is Christie’s element. Behind him: a banner that reads THE JERSEY COMEBACK HAS BEGUN. Taxpayers grimaced. The snake laughed. Chris Christie’s emotional modulations have been described as operatic. He tells moving stories about the passing of his mother, his high-school years, his experiences as a prosecutor. Christie’s talent has never been a knack for policy; his gifts are of the thespian variety. His twists of truth are somehow endearing — until one feels the knife plunge into skin. Watch Christie during a one-on-one interview — his curious manner of focused but not unnerving eye contact and subsequent exhale before responses — and for a combative man, he seems rather vulnerable. Human. He is less the man you want to have a beer with, and more a man that you might confide in — until you see him jumping up and down in a luxury box with the owner of the Dallas Cowboys, or saying the teachers’ union uses students “like drug mules.” It could be argued that Christie’s emotional pivots are patently Sicilian, but they are absolutely New Jersey. In the end, what do we want from our politicians? Who among us believes that we are not being lied to? 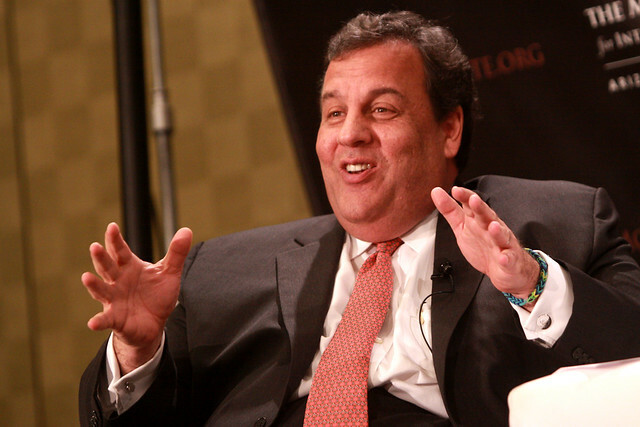 When it comes to politicians behaving oddly, Christie is the rule rather than the exception. I am fascinated by how people criticize Christie’s treatment of the media and then praise Hillary Clinton, whose evasion of reporters includes her quite literal roping of the media at recent events. The written word’s last big format change turned out to be a pretty big deal, fomenting revolutions and laying the groundwork for civil society, the scientific revolution, and nothing less than modernity itself. Christie is a thug and a bully with the heart of a fascist–pretty discouraging to see his face on The Millions. He’s a mean-spirited lap dog for the 1%. If he wouldn’t be a politician, he would be fully qualified to be a professional criminal. There’s nothing to admire about him. Interesting how an essay in which CC is likened to a “fire-breathing female monster with a lion’s head, a goat’s body, and a serpent’s tail” (Google def. of a chimera) is still too soft for the peanut gallery. My question for CDA and Jack would be: if the things you say about CC are true (and I can’t stand the guy either), what does that say about the people who elected him governor TWICE? American history is littered with rich and/or powerful assholes. If we don’t write and read stories about them, how are we to learn anything? I don’t agree with CC’s politics at all, but it’s fascinating how someone so repugnant and, moreover, terrible at his job not only wins re-election but ascends to the national scene. Why is this the case? What does this say about us?